Q: On August 18, the US Chairman of Joint Chiefs of Staff General Joseph Dunford held talks with the chief of staff of Japan's Self-Defense Forces Katsutoshi Kawano in Tokyo. Japan's Ministry of Defense hopes to accelerate the introduction of Aegis Ballistic Missile Defense System. In response, General Dunford said that the United States would provide help and it is quite important for the US and Japan to integrate ballistic missile defense capability. What is your comment? A: The Chinese government always maintains that the missile defense issue should be handled cautiously as it bears on global strategic stability and the mutual trust between major countries. While taking into account their own security interests, all relevant parties should respect the legitimate security concerns of other countries, jointly follow the principles of upholding global strategic stability and undiminished security for all countries and safeguard the international security environment featuring peace, stability, equality, mutual trust, cooperation and win-win outcomes. What needs to be pointed out is that due to historical reasons, Japan's relevant move in the field of military security has been closely followed by its neighboring countries in Asia and the international community at large. The military cooperation conducted by the US-Japan alliance should not harm the interests of a third party or jeopardize regional peace and stability. We hope that the US and Japan can act prudently and play a constructive role in promoting regional peace and stability instead of doing the opposite. Q: The US and the ROK have launched joint defensive military exercises today. What is your comment? A: Currently, the situation on the Korean Peninsula is highly complex, sensitive and delicate. It calls for greater concerted efforts of such parties directly concerned as the DPRK, the US and the ROK in a bid to ease the tensions. The joint military drills conducted by the US and the ROK are not helpful to the de-escalation of the current tensions and the efforts made by all relevant parties to promote peace talks. We once again urge the US, the ROK and other relevant parties to take seriously and give positive consideration to the "suspension for suspension" proposal and take constructive actions that are conducive to the abatement of tensions and the early resumption of peace talks for the proper settlement of the Korean Peninsula nuclear issue. Q: The government of Ontario, Canada has submitted a motion to the provincial Legislature requiring the designation of December 13 as the "Nanjing Massacre Remembrance Day". The provincial Legislature of Ontario will vote on the motion in September. The Japanese media reported on August 20 that the Liberal Democratic Party of Japan has decided to organize some of its members to lobby the Canadian government and the provincial Legislature of Ontario with the view of preventing the setting of the Remembrance Day. What is your comment? A: We have noted relevant reports and welcome the relevant motion of the provincial Legislature of Ontario, Canada. This year marks the 80th anniversary of the Nanjing Massacre. The Nanjing Massacre is a grave crime committed by the Japanese militarism during the Second World War and it is a painful history which cannot be obliterated. Only by drawing lessons from history in a profound manner and taking history as a mirror can we avoid the repetition of the tragedy of war and truly uphold peace and usher in the future. Q: The decision by the High Court of Hong Kong to imprison the three major participants of the illegal "Occupying Central" campaign has drawn some international "criticism". What is the response of China? A: The High Court of the Hong Kong Special Administrative Region made the judgment of the relevant case in accordance with law. I am wondering whether those people who made the so-called "criticism" have read the verdict of the High Court carefully. I would like to stress that the right to freedom of speech and the way to exercise this right are two totally different issues. The residents of Hong Kong are entitled to rights and freedom in accordance with law. However, the abovementioned three people overstepped the boundary of law by holding unlawful assembly in an illegal and violent way or instigating others to engage in unlawful assembly, which posed serious harm to the public order and public tranquility. Respecting the rule of law has no difference in terms of the capacity of the people, the place and the country. Double standards should not be practiced. We hope that relevant parties can respect the High Court of Hong Kong for dealing with this case in accordance with law and the judicial independence of Hong Kong. Q: Firstly, as for the US-ROK joint military drills, the number of US troops participating in the drills decreased by 75 hundred. What is your comment? Although the drills are still going on, its scale has been downsized. Does China believe this can be counted as a response of the US and the ROK to the "suspension for suspension" initiative proposed by China? Secondly, with regard to the commemoration for the 25th anniversary of the establishment of the ROK-China diplomatic ties, relevant authorities of the two countries held relevant commemorative activities respectively instead of jointly. Some people say this symbolizes that the ROK-China relations are not stable. What is the comment of the Chinese side? A: Regarding your first question, I have taken note of the relevant report and I have also noted that relevant parties said that the scale of the military exercises had been determined beforehand. What we are concerned about is whether the military exercises can help to build mutual trust between relevant parties and ease the current tensions on the Korean Peninsula. We hope all relevant parties can take more constructive actions that can help to ease the current tensions on the Korean Peninsula and properly resolve the Korean Peninsula nuclear issue through peace talks rather than add fuel to the fire. As for the current situation on the Korean Peninsula, recently we have stated our positions many times. Indeed, thanks to the concerted efforts of all relevant parties, the tense situation on the Korean Peninsula has shown a slight sign of abatement recently, but this is far from enough as the situation remains highly tense. Therefore, we hope the parties directly concerned in the Korean Peninsula issue, including the DPRK, the US and the ROK can make greater efforts. We have pointed out multiple times that the core and essence of the Korean Peninsula issue are the security issue. Only by properly addressing the legitimate security concerns of all relevant parties through dialogue can we truly open the door of peacefully resolving the Korean Peninsula nuclear issue. The pressing task now is to stop the DPRK's nuclear and missile programs and cease the vicious cycle of the escalation of tensions on the Korean Peninsula. We hope that all relevant parties can truly proceed from the interests of their own people and the larger picture of regional peace and stability to make right judgments and decisions. We also hope that all relevant parties can give positive consideration to the "suspension for suspension" proposal as it is the most reasonable, fair and viable proposal under the current circumstances. 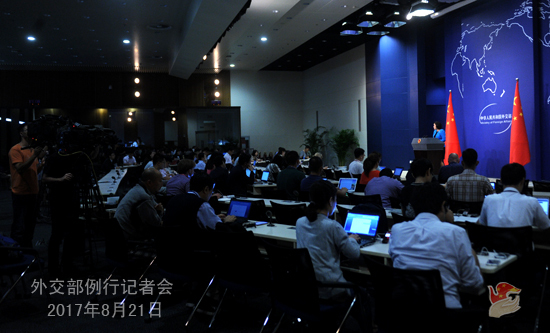 With regard to your second question, I am not aware of the detailed arrangements for the commemorative activities for the 25th anniversary of the establishment of the China-ROK diplomatic relations but I want to stress that we attach importance to the China-ROK relations. China and the ROK are close neighbors and developing steady and sound bilateral relations serves the interests of both sides. We hope that the ROK can take seriously the reasonable and legitimate concerns of China on relevant major issues and take constructive actions to promote the mutual trust between the two peoples and the growth of bilateral relations. Q: Last week the Indian government confirmed there was an incident of scuffle between Indian and Chinese troops near Pangong Lake in the western part of the China-India boundary. Moreover, there is a video that probably shows Indian and Chinese soldiers are kicking, shoving and pelting stones at each other. Do you have any comment on that? A: The Chinese side has verified that on August 15, the normal patrol conducted by the Chinese border troops in the Chinese side of the Line of Actual Control (LAC) near Pangong Lake in the western part of the China-India boundary was obstructed by the Indian border troops. The Indian side took some violent actions to collide and scuffle with the Chinese side, which injured the Chinese personnel. India's action violates the relevant consensus reached between the two sides on upholding the peace and tranquility of the boundary areas and endangers the situation of the western part of the China-India boundary. The Chinese side is strongly dissatisfied with this and has lodged stern representations with the Indian side through border-related channels. 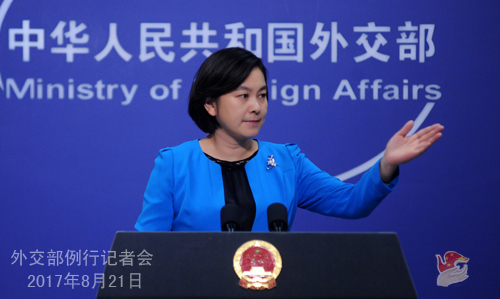 China urges India to abide by the provisions of relevant conventions and treaties, earnestly follow the 1959 LAC, strictly restrict the activities of its border troops and faithfully maintain the peace and stability of the boundary areas of the two countries. Q: Today a US warship collided with an oil tanker in the waters near Singapore. There are sailors who have fallen into the water. Has the Chinese side been involved in the search and rescue efforts of the United States? A: I have noted the relevant report and hope that the missing are safe. I have not been informed about whether the Chinese side has received any request to join in the search and rescue efforts so far. 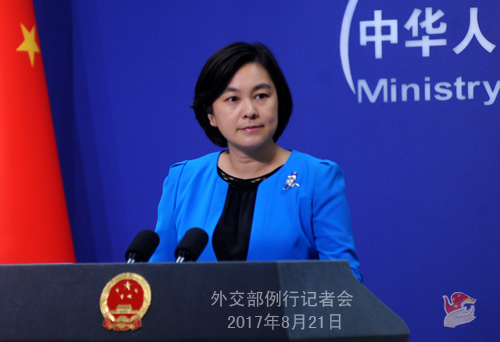 However, we are concerned about the threat and hidden danger posed by the relevant incident to the safety of navigation in the South China Sea and relevant waters. We hope that the relevant issue can be handled properly.